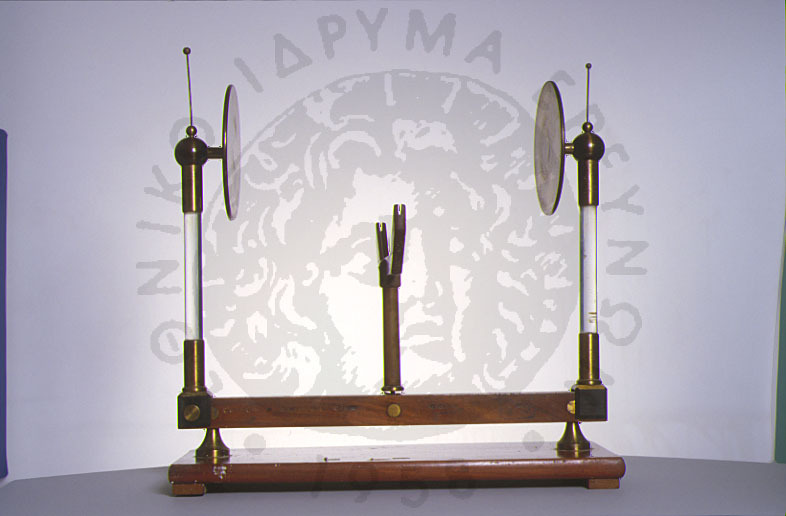 Used at the laboratory of the first Gymnasium of Athens, Plaka. This is an early device used to experiment with the properties of a condenser (now known as a capacitor.) The Aepinus condenser was the first condenser developed after the Leyden jar and was used to demonstrate conductive and inductive electricity. Two circular brass plates, A and B, are mounted on insulating supports, and arranged to be moved towards or away from each other as desired. Between them is a plate of glass, C, or other dielectric. Pith balls may be suspended back of each brass plate as shown. The apparatus is charged by connecting one plate to an electric machine and the other to the earth. The capacity of the plate connected to the machine is increased by bringing near to it the grounded plate, by virtue of the principle of bound charges.